ZHAO Lingxia,2006. Comprehensive Dental Study on Gigantopithecus. Ph.D. Dissertation, Graduate School of Chinese Academy of Sciences. Beijing. Zhao Lingxia, Hou Yamei, 2008. Early hominin evidence and related hominoid fossils in Southern China. Human Evolution, 23(1):137-144. DONG Wei, ZHAO Ling-xia, WANG Xin-jin, CAI Hui-yang, ZHENG Yuan-wen, ZHANGZhong-wen.2010. Artiodactyla Associated with Gigantopithecus from Baeryan, Bijie, Guizhou Province. Acta Anthropologica Sinica,29:214-226. Smith TM, Bacon AM, Demeter F, Kullmer O, Nguyen KT, de Vos J, Wang W, Zermeno JP, Zhao LX,2011. Dental tissue proportiond in fossil orangutans from mainland Asia and Indonesia. Human Origins Research,2011,1:e1. Zhao Lingxia,2006. Dental caries of Gigantopithecus blacki from Longgudong cave in Jianshi of Hubei. 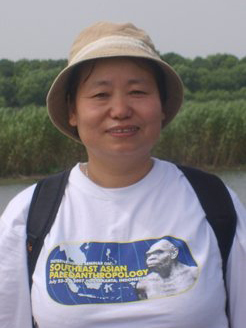 Dong Wei(ed): Proceedings of the Tenth Annual Meeting of the Chinese Society of Vertebrates Paleontology. Beijing: China Ocean Press.103-108. HAN Kangxin, ZHANG Jun, ZHAO Lingxia, 1997. The study of racial characteristics of human skulls from ancient cemetery at Chawuhugou, Hejing county, Xinjiang. TONG Yongsheng (et al. eds): Evidence for Evolution—Essays in Honor of Prof. Chungchien Young on the Hundredth Anniversary of His Birth. China Ocean Press. 23-38.